by Brianna Crandall — October 10, 2018 — The International Facility Management Association (IFMA) has just released its second report on the return on investment (ROI) of its professional development program. The first report found a striking 15:1 ROI for individual FM professionals in terms of salary and career advancement. This report continues the story, quantifying the value organizations and employers achieve from employing IFMA credential holders. 70 percent of organizations rate IFMA credentialed employees as having statistically significantly higher performance. 12 percent increase in employee performance for each US$2,000 spent on IFMA credentials. The average IFMA credential results in more than a 40 percent increase in employee performance. IFMA’s globally recognized FMP (Facility Management Professional) designation is a knowledge-based credential for FM professionals who study and successfully complete a series of comprehensive exams covering four knowledge domains: operations and maintenance, project management, finance and business, and leadership and strategy. What IFMA calls the “one-of-a-kind” SFP (Sustainability Facility Professional) designation is an assessment-based program delivering a specialty credential in sustainability to FM professionals who wish to develop sustainable facilities management practices. Since it was first developed in 1992, the CFM (Certified Facility Manager) has grown into the most respected global certification for facilities management, says IFMA. As the organization’s most prestigious credential, the CFM covers the full scope of FM skills and knowledge as identified by the Global Job Task Analysis, which shapes the educational landscape that informs all of IFMA’s educational products. IFMA’s industry-defining fm.training platform also offers the popular Essentials of Facility Management courses along with FM professional designations available through the IFMA-RICS collaboration, including AssocRICS and MRICS. The research report was released by the FM Research and Benchmarking Institute at IFMA’s World Workplace Conference and Expo last week in Charlotte, North Carolina. It included participation from 31 FM organizations from around the world and across several industries. The report features three detailed case studies. 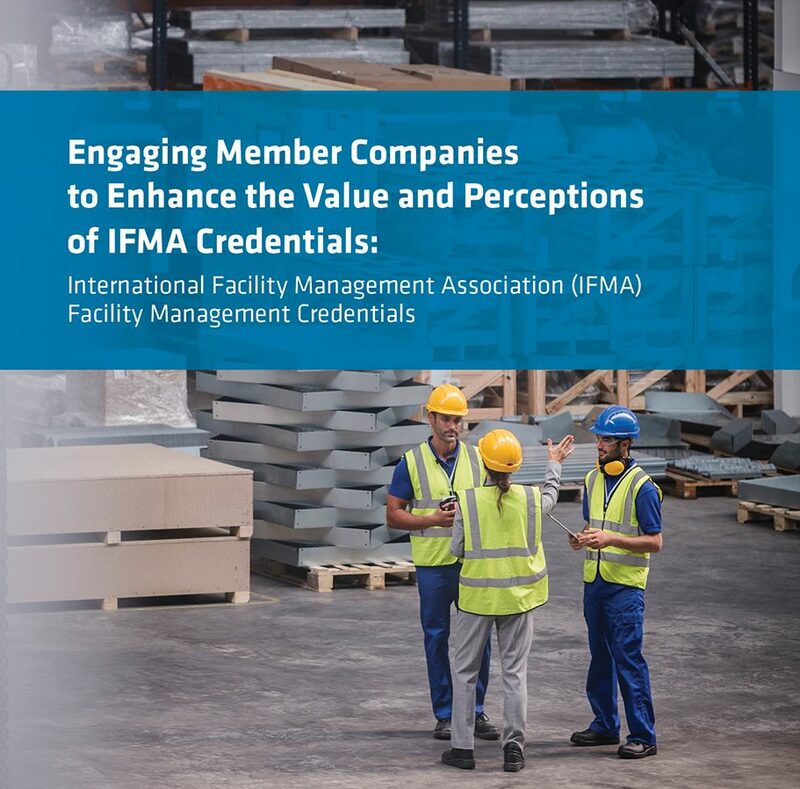 The digital Engaging Member Companies to Enhance the Value and Perceptions of IFMA Credentials: International Facility Management Association (IFMA) Facility Management Credentials report is available for sale in the IFMA store for $295 for IFMA members ($445 for non-members). Find out how Accruent’s CMMS software acquisition can help your multi-site facilities move from reactive to preventive maintenance June 13, 2018 In "Developments » Corporate and Organization"
Abatement/remediation liability insurance April 14, 2019 In "How To » BOMI International"
To help unlock the true value of connected things in building operations, take a look at these new IoT apps August 8, 2018 In "Products and Services » Software & Technology"
Find out how you can keep all facilities team members in the loop for build-out and operations projects through this new mobile app September 5, 2018 In "Products and Services » Software & Technology"